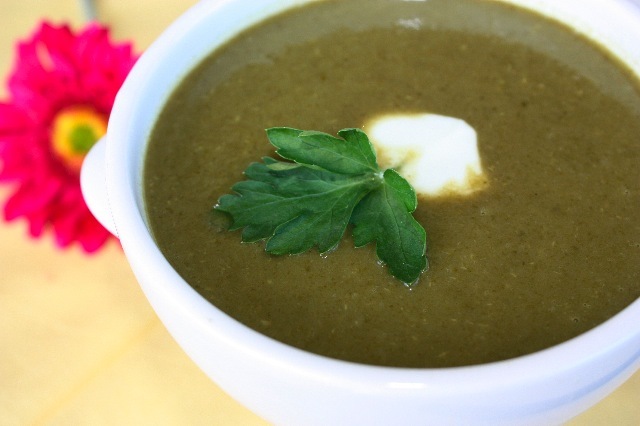 A friend of mine told me one day that her mom made excellent soup with radish leaves, that it was something quite delicious and a typical summery dish from her region in the South of France. Thinking about it, I believed her since “root” leaves seemed to be quite flavorful and I wanted to try it for myself. I found some beautiful and long turnip greens at the store and thought that could be substituted to radish leaves. They are quite tasty with a nice peppery flavor. 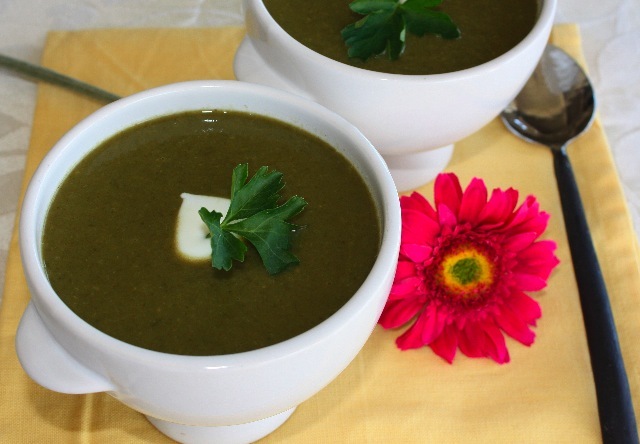 The soup is hearty, made with just a few ingredients, it doesn’t need to have tons of spices and extra ingredients for flavor since the leaves are naturally flavorful and delicious. Heat olive oil in a pot, add onions and brown them for about 10 min, then add potatoes and turnip greens, stir for a couple of minutes. Add vegetable stock, salt and pepper and cover for about 25 minutes until the potatoes are cooked. Blend soup in a blender, place in bowls and add 1 tbs of yogurt or crème fraîche in the middle of the bowl and serve hot. This entry was posted by silvia on March 22, 2009 at 12:36 pm, and is filed under Soups. Follow any responses to this post through RSS 2.0.You can leave a response or trackback from your own site. This was delicious. I had both radish and turnip greens, and used sweet potatoes because I didn’t have potatoes.